Baby Acne – Why Does My Baby Have Pimples? No new mother wants to see little red or white spots on her baby’s cheeks. Believe it or not, but these red bumps are baby acne. That’s right – your baby has pimples. Although it’s not a pretty sight, baby acne is usually nothing to worry about. It is temporary and a common experience. The pimples will clear up within a few weeks or months. Baby acne is quite common in newborns and infants, and it’s characterized by small white bumps that are surrounded by red, raised skin. The red bumps look worse when your baby is crying or fussy. Baby acne can also be irritated by saliva, spit-up, and fabric that’s been washed in strong detergents. Sometimes, infants are born with acne. In a majority of cases, however, the pimples show up within the first month of life. This condition might come and go until your child is six months old. Babies can get acne on their cheeks, foreheads, chins and even their backs. Although the pimples look uncomfortable, they aren’t causing any discomfort to your child. The tiny, white bumps of milia usually appear on the baby’s cheeks, nose, chins. Although it may be upsetting to see your baby’s beautiful skin covered in tiny bumps, milia isn’t contagious and it isn’t painful. Typically, it disappears on its own within three weeks. Milia affects up to 40 percent of all newborn babies. This infant skin condition develops because dead skin became trapped in tiny pockets at the skin’s surface. Milia disappears once the dead skin cells are sloughed off. In contrast to milia, baby acne is caused by hormonal changes that take place near the end of the pregnancy. In the final trimester, a mother’s hormones cross the placenta to her child. This can stimulate the oil glands on the baby’s skin and eventually lead to baby acne. Sometimes, if you take certain medicines while you’re breastfeeding, this can also trigger baby pimples. For some reason, baby acne is more common in boys than girls. How Long Does Baby Acne Last? Baby acne usually goes away after a few weeks of the break out, but it can stick around for up to three months. If your baby still has pimples after three months or you’re worried about the acne, don’t hesitate to ask your pediatrician about it. In very rare cases, baby acne may be a sign of a hormonal problem at play. Some children have baby acne from three weeks to six months after birth. Acne tends to occur at about the same age as the baby’s peak gas production and fussiness. There are other skin issues that look similar to baby acne, like baby eczema, that will not go away on their own. Infant eczema is also a common skin problem in babies. It usually shows up between one and five months of age. 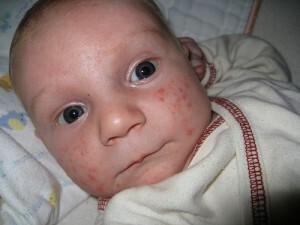 With baby eczema, the infant has red bumps and patches in various locations. Eczema often marks both cheeks but it can be much more diffuse. Some babies will have the rash all over their bodies as they get older. Although it’s correct that some babies with bad eczema have allergies, such as a milk allergy, in many cases of baby eczema, there is no known cause. Some infants who have eczema outgrow it as they get older, while others continue to have difficulties with it throughout childhood. Eczema is treated with moisturizing agents, and if it’s severe, may also be treated with steroid creams or other prescription ointments. So what can you do to treat baby acne? The best treatment is leave the baby pimples alone. Baby acne typically goes away on its own. Although it may be tempting, please do not put creams or lotions on the pimples. This will just make the acne worse. Baby acne is not a result of dirt, so scrubbing is not the answer. This will only irritate your child’s skin. Frequent washing can also irritate the baby’s skin. If the acne bothers you, you may wash your infant’s face with a mild baby soap and water once every day. Try to be patient, though. Your baby’s pimples don’t bother him, so you should not let their appearance bother you. Baby acne will clear up on its own without any treatment. If the acne is severe or lasts beyond six months, your pediatrician may prescribe a mild medicine to help. Otherwise, you can expect that the acne will be a memory in a few months. The oil glands will clear up, and you won’t see the acne again until your precious child becomes a teenager. Actually when someone doesn’t know afterward its up to other users that they will assist, so here it happens. Привет , я читал ваш блог иногда и у меня есть подобный один и я был просто интересно Если вы получаете много спама Обратная связь ? every one is sharing information, that’s genuinely excellent, keep up writing. This design is spThis design is spectacular! You obviously know how to keep a reader entertained. Between your wit and your videos, I was almost moved to start my own blog (well, almost…HaHa!) Wonderful job. I really enjoyed what you had to say, and more than that, how you presented it. Too cool!ectacular! You obviously know how to keep a reader entertained. Between your wit and your videos, I was almost moved to start my own blog (well, almost…HaHa!) Wonderful job. I really enjoyed what you had to say, and more than that, how you presented it. Too cool! Hey just wanted to give you a quick heads up and let you know a few of the images aren’t loading correctly. I’m not sure why but I think its a linking issue. I’ve tried it in two different browsers and both show the same outcome.st wanted to give you a quick heads up and let you know a few of the images aren’t loading correctly. I’m not sure why but I think its a linking issue. I’ve tried it in two different browsers and both show the same outcome. It´s a funny thing with baby acne, it comes and goes suddenly. I know you already said it, but I definitely want to stress to be careful what products you use. So many acne products have such harsh chemicals in them! Really have to be careful with labels, even on moisturizes and such.